In the Fashion Retail world, every instance of a stockout represents a failure to fulfill consumer demand. The ramifications of out-of-stock situations do not end at the initial sale; it extends to loss of companion sales, inability to salvage future shopping trips and potentially, the loss of loyal consumers. How can companies combat this challenge which has plagued the industry for decades? The answer may lie with your operational backbone - your ERP system. 82% of consumers will substitute and switch brands due to an out-of-stock product. In today’s highly competitive Fashion-Retail industry where 65% online shoppers have been disappointed by out-of-stocks in the past 12 months, its a cost which brands simply cannot afford. This poses an interesting challenge for many retailers who rely heavily on manual and tediously slow processes for checking inventory availability. Recent years have shown advances in POS and other systems that give the associates visibility into nearby stores’ inventory. But, more often than not, even when the Out of Stock item can be found at an in-stock location, there is no effective process to confirm item availability and prompt the item to be reserved for the customer. This hurdle becomes twofold considering the growing demand of consumers who request for more granular visibility into inventory availability. Rather than simply indicating “In Stock” or “Out Of Stock”, consumers now consider it important for a retailer to provide actual inventory – a factor that greatly influences where they shop. Ultimately, the question that fashion retailers face is a simple one. How do they consistently fulfill consumer demand for an out-of-stock item? The best response to this question has been demonstrated by those retailers leveraging an integrated system and infusing their supply chains with the agility required to adjust inventory levels on-the-go across their channels. The ability to flexibly source from any channel’s inventory pool to fulfill an order for any other channel is critical. These brands are redefining consumer engagement by leveraging sale-the-save initiatives that place the highest priority on getting in-demand products into the hands of consumers by intelligently sourcing inventory from another in-stock location, regardless of the channel. The benefits include: increased, immediate customer satisfaction, an improved long-term overall shopping experience for the customer, increased operational efficiency, and increased revenue. However, when it comes to intelligent cross-channel sourcing, legacy or home-grown systems tend to struggle in an attempt to process massive volumes of data required to gain comprehensive end-to-end inventory visibility across all channels. This is mainly due to fashion companies managing their retail, wholesale and ecommerce channels as separate business units, with disparate inventory pools. While piecemeal interventions at crucial points in back-end legacy systems have produced useful results for retailers to help manage out of stock across channels, it is becoming increasingly clear that a truly integrated core solution is required to respond to fluctuations in consumer behavior and ultimately, deliver the right items to consumers. With so many potential facets involved in cross-channel sourcing and order management, retailers such as The Rockport Group are leveraging SAP Fashion Management, an omnichannel solution that unifies retail and wholesale to redue stock outs and gain endless aisle capabilties. When integrated with an ecommerce solution such as SAP Hybris, and SAP Customer Activity Repository, the trifecta allows a fashion company to combine its B2B and B2C backend systems. Not only does this give the company a single view of its inventory, but it also allows a fashion company to run as a single business, rather than two separate wholesale and retail businesses. Brands that integrate SAP Fashion Management and SAP Hybris will be able to retrieve stock levels in real-time for a more flexible use of inventory across channels. The result is a system that will enable brands to fulfill the demand for their products from anywhere through cross-channel inventory consumption. This enables customers to purchase products online or in-store and pick up or return products to stores with ease. When it comes to ‘Save the Sale’ and confronting an out-of-stock situation in-stores, SAP FMS offers total inventory visibility to store associates to source items in an order from any inventory pool, including inventory held for other channels. In so doing, fashion retailers can maintain adequate in-stock quantities while eliminating duplicate safety stock, which legacy systems held separately in each inventory pool that often resulted in excess safety stock. Store associates are provided with visibility into inventory. An in-store kiosk offers associates a convenient mechanism to capture orders for out-of-stock items in the store and trigger a notice to the warehouse, where the item is then shipped to the customer’s home. Store associates are provided with visibility into inventory. Leveraging the in-store kiosk, the associate captures the order for the out-of-stock item and triggers a notice to the selected store to reserve the item. The item will be picked up by the customer. 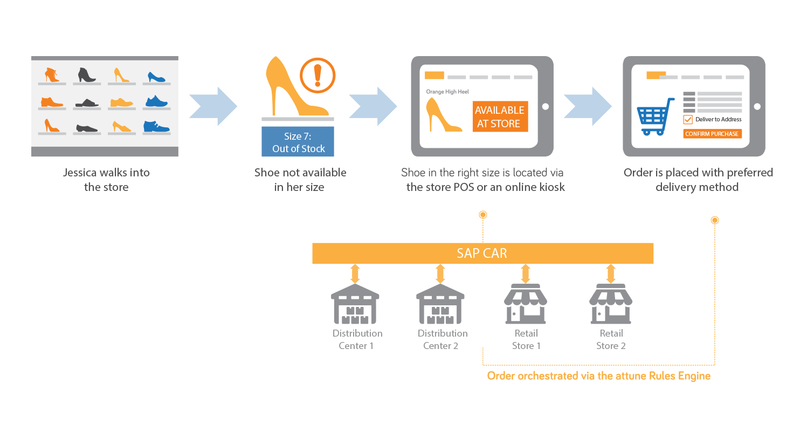 In both these scenarios, in-built segmentation strategies in SAP FMS helps clearly separate inventory across each channel (retail, wholesale and e-commerce), and cross-consumption tactics help retailers prioritize which channel can consume inventory from another in case of stock-outs - with stock protection in place to ensure items are always available for high priority orders/segments. One of the key elements tying this all together is our order orchestration rules engine, which helps determine the most suited site for shipping to the customer - taking into consideration multiple factors such as geo-location. Out-of-stock (OOS) situations can erode revenue, undermine customer loyalty and—with the reach and immediacy of social networks— become highly visible to communities in a matter of minutes. As a growing number of consumers consider it important for a store associate to be able to find an OOS item at an in-stock location, it is clear they are willing to purchase an OOS item if it can be found at another location. 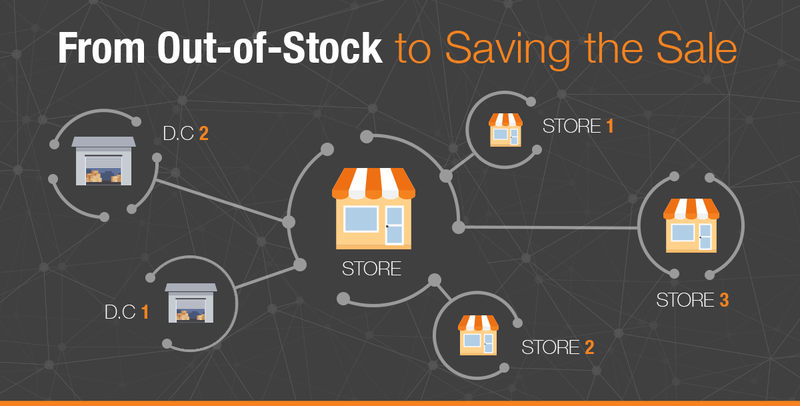 Although out-of-stock situations may never be eradicated, retailers have a chance to recover from them and save the sale in a majority of cases if they are armed with the ability to flexibly respond and fulfill demand as needed by tapping into all their inventory sources.